The day after the typhoon was sunny and cool. We walked back down the Edogawa (the boundary between Tokyo and Chiba Prefectures) past the Kuramae Dori Bridge and the Sobu Railway Bridge and eventually we arrived at the Keiyo Road Bridges. They must have built one bridge later as Keiyo Road became more congested. I'm guessing the newer bridge is on the pier walls, but it's hard to be sure. The girder flanges on both bridges appear to be riveted, which means they're both fairly old. However, the elastomeric bearings on the bridge with hammerhead bents look in worse shape. Also, the bridge on pier walls is a continuous 880 ft long frame. 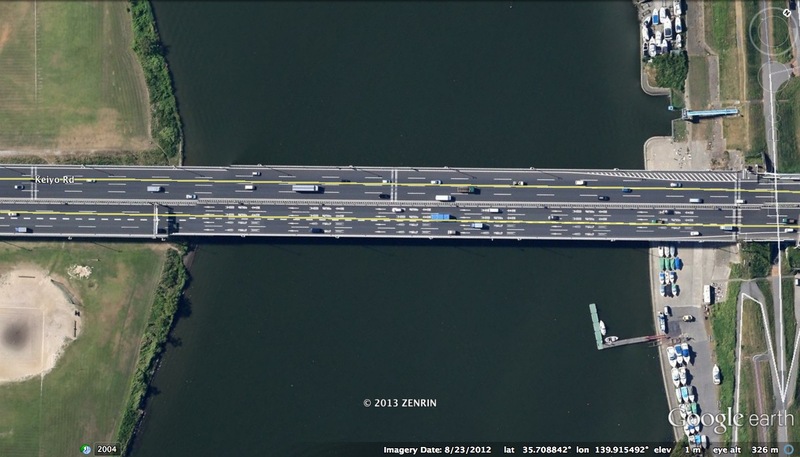 The bridge on hammerhead bents is divided into two 550 ft long frames (see Google Earth photo below). I would imagine that longer frames came later. Tokyo Prefecture, Japan's Bridges: Keiyo Bridge across the Edogawa by Mark Yashinsky is licensed under a Creative Commons Attribution-NonCommercial-NoDerivs 3.0 Unported License.